Sophomore guard Jacob Davison drives against Northern Arizona on Feb. 4. Davison scored a career-high 41 points with seven 3-pointers. From 20 seconds after the opening tip, it was clear sophomore guard Jacob Davison would not be stopped Monday night. Davison opened the scoring with a 3-pointer and went on to score 14 of EWU’s first 16 points. He finished with a career-high 41 points, as the Eagles (8-13, 6-4) beat Northern Arizona (7-14, 5-6) 82-64 on Reese Court. Davison shared long embraces with his teammates after the game was over. Over the last five games he is averaging 26 points. 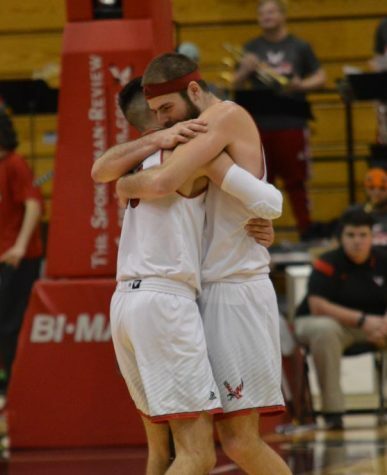 Sophomore Jacob Davison embraces senior Jesse Hunt as time expired in EWU’s 82-64 win over Northern Arizona Monday night. Davison scored 14 of the Eagles’ first 16 points in the game. With Davison’s effort, the Eagles never trailed against the Lumberjacks. They have now won four-of-five games. 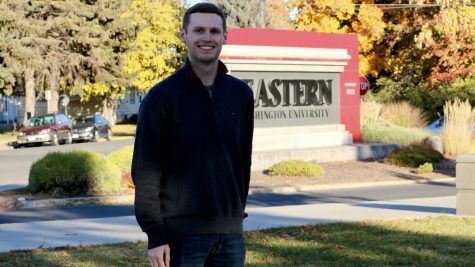 At the halfway point of the conference schedule EWU firmly holds the No. 4 spot in the Big Sky. Senior forward Mason Peatling remained inactive for the second straight game, recovering from lingering foot problems from the start of the season. In his place, freshman forward Tanner Groves scored a career-high 13 points with 11 rebounds for his first career double-double. Senior Forward Jesse Hunt continued to be a key contributor for the Eagles scoring 15 points with 11 rebounds. The Eagles will head on the road for a two game stand in Montana against Montana State on Feb. 7 and Montana on Feb. 9. 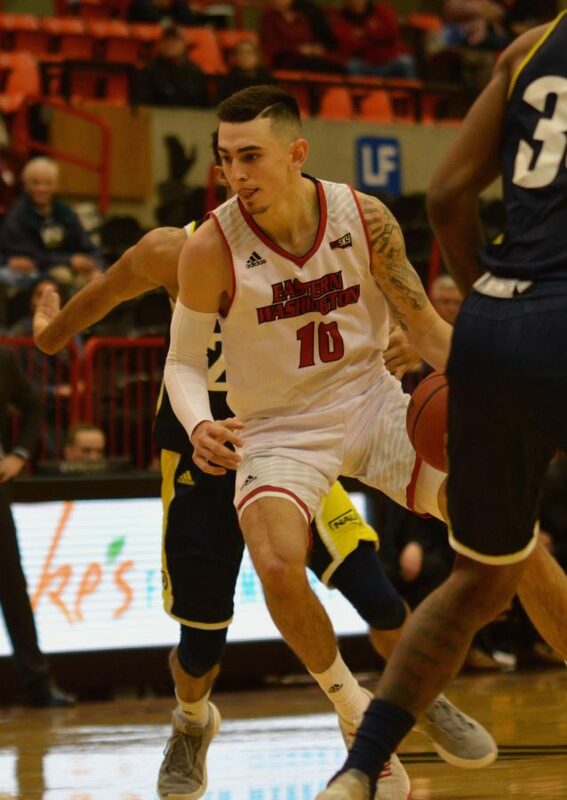 EWU previously beat both teams at home this year, topping MSU 85-81 on Jan. 19, and UM 78-71 on Jan. 10.